Historically speaking, buying Alcoa stock when aluminum prices were down has led to opportunities to profit. 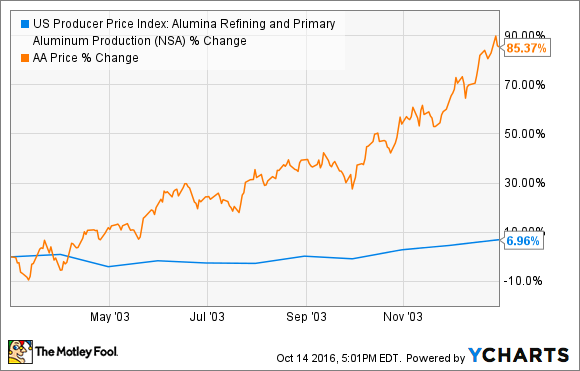 Investing in Alcoa based on aluminum prices could pay off -- or not. Image source: Getty Images. 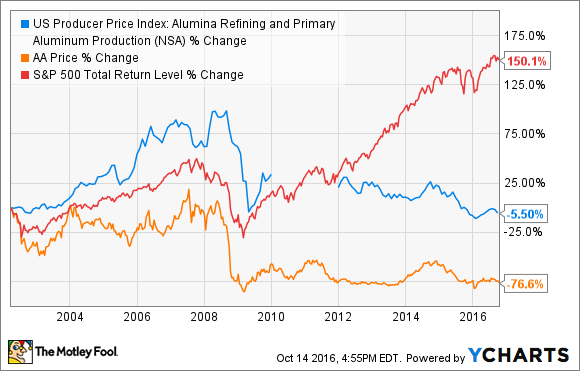 U.S. Producer Price Index: Alumina Refining and Primary Aluminum Production data by YCharts. But historically speaking, the best time to buy Alcoa has often been when aluminum and alumina -- a precursor material that is refined from bauxite -- prices were low. And they're pretty low right now. 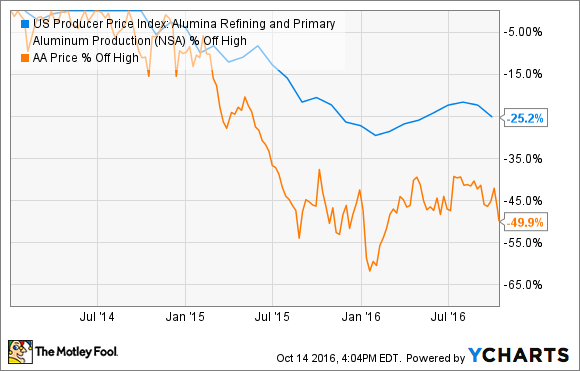 US Producer Price Index: Alumina Refining and Primary Aluminum Production data by YCharts. This table starts in 1980, when the producer price index for primary aluminum and alumina was 100. In other words, aluminum producers are only getting slightly more today than they were for their product 36 years ago, and far less than they were for much of the past decade plus. Current prices are even lower than those of the Great Recession. Just as with most commodity markets, supply and demand is behind this, with global production way up over the past half-decade, far exceeding demand growth, resulting in a large surplus of global inventory, and driving prices down substantially. According to Alcoa and other industry sources, 2016 has been the first year in many where demand growth has exceeded supply, with roughly 5% growth in demand versus 3% supply growth. Alcoa management projects that this will lead to a deficit of 1.6 million metric tons of alumina and 615,000 metric tons of aluminum for the full year, helping work through some of the glut that has been driving prices down for the past several years. 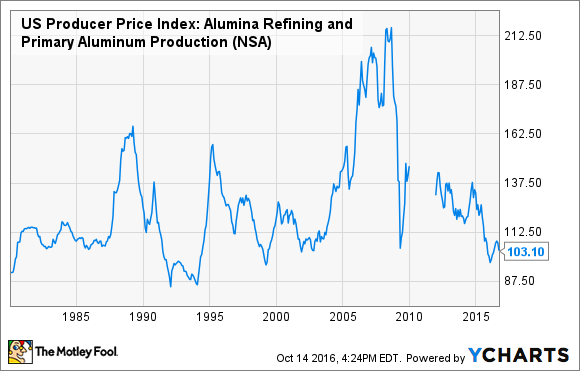 If the trend of slower production growth holds true for the rest of 2016 and carries into 2017, that would certainly bode well for alumina and aluminum prices. Furthermore, Alcoa has cut its production costs. According to its most recent quarterly earnings release, Alcoa is in the 17th percentile of the global alumina cost curve, and in the 38th percentile of the aluminum cost curve. This means that Alcoa can produce alumina more cheaply than 83% of global production and aluminum more cheaply than 62% of global production. As a lower-cost producer, Alcoa should be in a solid position to ride out the current environment, while positioning itself for outsize profits when commodity prices eventually rebound. This is a far-from-perfect opportunity, and certainly not a "buy and hold" investment due to the impact of volatile commodity prices when you're a primary producer like Alcoa. I have to confess that this is an appealing opportunity to profit from higher aluminum prices. But as anyone who's followed the oil market will tell you, prices can stay much lower than you expect, and for much longer than you think. After all, there are many things that go into a complex global market that we just can't know, that can have major repercussions on that market. At the same time, Alcoa's position as a low-cost producer reduces some of the downside, while also boosting its profit potential from higher prices. Bottom line: If aluminum prices do rise, which they surely will if the current supply/demand imbalance continues, this could make for a strong cyclical opportunity to buy Alcoa on the weak side of the aluminum market. But the hard part will be holding through the cycle of prices rising, and knowing when to sell.